It's funny what you will remember from your past. People will tell you a story from five years before which, upon hearing, you would have thought you might remember it. But not a glimmer of recognition comes your way. Happens to me often. On the other hand, ask me about kindergarten and I can regale you with glimpses of that past. There was the new friend who could colour as if she was born with a crayon in her hand. There was my teacher, a matronly grandmother type, a few years shy of retirement, who made you think of milk, cookies and comfort. There were the colourful orbs used for teaching numbers. There was nap time, all of us stretched out on our blankets with absolutely no interest in settling down. Kindergarten in those years was divided into half days and we were in the morning class. The idea that tiny tots would be ready to snooze hours after waking was wishful thinking. Among my most vivid memories, though, was Valentine's Day. My friends and I, prior to growing up and entering the world of education, had exchanged cards. But this was the first time we would be including an extended group of acquaintances. In preparation, there were craft days of cutting, clipping and pasting together special creations for Moms and Dads. But one of the biggest projects was the decorating of the container that would hold the messages from our Valentines. On Feb. 14 we left no one out, stuffing these boxes with our different versions of Be Mine, Valentine! They were cute little images with adorable creatures, cute kids and charmingly silly puns. 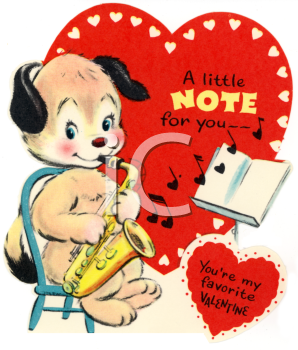 Years have gone but I remember those vintage Valentines with fondness. If you too like the vintage greetings of yesteryear you'll love this sweet collection from iCLIPART.com.